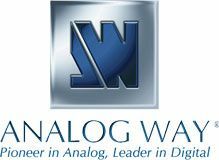 Analog Way has appointed two new representative firms for the Southeast US. Effective May 1, Mainline Marketing will be Analog Way's representative for Florida, and HWPco will be in charge of Alabama, Georgia, Mississippi, Tennessee, North Carolina, and South Carolina. Founded in 1987 and based in Melbourne, FL, Mainline Marketing will serve exclusively the state Florida, while HWPco will serve Alabama, Georgia, Mississippi, Tennessee, North Carolina and South Carolina. Both organizations have access to Analog Way's complete product portfolio which includes our latest and very successful generation of Presentation Switchers/Mixers based on the LiveCore and Midra technology platforms. "I am thrilled to have Mainline Marketing and HWPco represent Analog Way in the Southeast territory," said Jay Gonzalez, VP Americas at Analog Way Inc. "Their teams of dedicated professionals show proven experience and field knowledge which will be instrumental in our growth plans for the region. We look forward to fruitful collaboration."